Sightlines Bleachers is a trusted provider of Tip-N-Roll Bleachers in Kentucky. 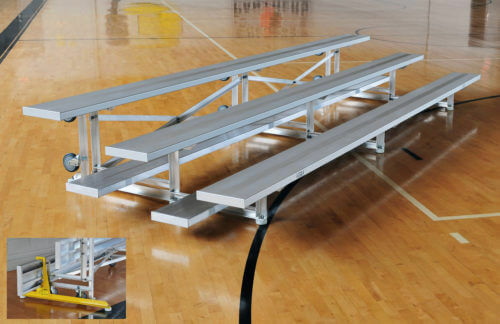 Our aluminum Tip-N-Roll Bleachers are designed for temporary bleacher installation, quick transport, and easy removal. Here’s what you get when you order Tip and Roll Bleachers from Sightlines Bleachers. • Our tip-n-roll bleachers are durable and lightweight making them easy to move around your gym or any flat surface. • The sightlinesbleachers.com tip-n-roll bleachers all come with non-marring pads to protect your floors from scuffing and prevents any sharp aluminum edges from coming into contact with your floor. • Sightlines Bleachers include an EXCLUSIVE stabilizer bar with all of our tip-n-roll models. This stabilizer will keep the bleacher from tipping over when in the storage position. • All of our planking is 1-3/4” thick instead of our competition’s standard 1-1/2”. What does this mean? Our plank has a higher loading capacity than our competition who uses a smaller plank size. • All of our understructure frames are built with a minimum 2” x 2” aluminum angle vertical pieces. Most of our bleachers can be upgraded to a TSA version which includes a 2”x2” minimum square tube. With Sightlines Bleachers, you can rest assured knowing your Tip-N-Roll Bleachers are guaranteed safe, secure, and built to last. Get in touch with the Sightlines Bleachers team at 1-800-609-1545 to place an order or learn more about our products and services.